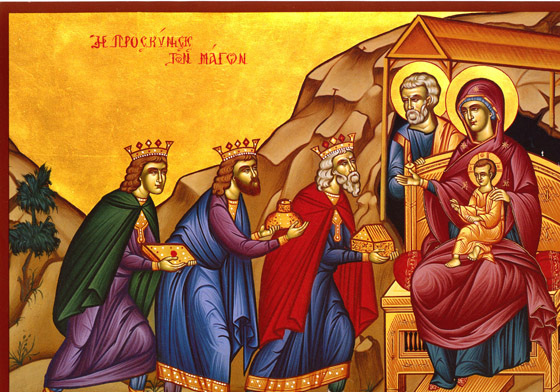 The Wise Men's Gifts, gold, frankincense, and myrrh, according to the Sacred Tradition of the Orthodox Church, were kept by Jesus' Mother, the Most Holy Theotokos. They were her most priceless possessions. Just before her falling asleep (koimisis) and, after blessing them she gave them, for safekeeping, to two of Christ's faithful virgins, who cared for her. Together with the holy gifts, she gave them also her holy gown, her sacred belt, and Jesus' holy swaddling clothes. The Ever-Virgin Mary's belt is now at Holy Mountain Athos, in Greece, in the Monastery of Vatopedy. From time to time it is brought to the Mainland of Greece to be venerated by the Orthodox Christian faithful. Her sacred gown is now in the city of Constantinople (Istanbul, Turkey); the priceless treasure of the Greek Orthodox Ecumenical Patriarchate. The first three hundred years, the Wise Men's sacred gifts were kept by faithful virgins in Jerusalem and were venerated by the faithful Christians. Those who venerated them with faith received healing for their bodies and souls. The fame of the divine gifts performing miracles reached the city of Constantinople in (400 A.D.). The Christians of Constantinople beseeched Emperor Arcadius to command that the holy gifts be brought to the Queen City, for the blessing of the people and the protection of the city. A Royal ship and a company of pious Priests, Monks and laymen traveled to Jerusalem, where they received from the faithful virgins the precious treasure. They brought the gifts to the Emperor in an atmosphere of Christian celebration and joy. The God-fearing Emperor knelt before the gifts, venerated them, then took them in his hands and kissed them reverently. His Cabinet members and all the people did the same. Everyone, chanting the psalms and hymns and burning incense, formed a parade and carried the holy gifts to the church's treasury in Agia Sophia, the Church of the Holy Wisdom. The gifts were encased in gold and silver cases, and remained in the treasury until the Fall of Constantinople at the hands of the Latin Crusaders in 1204 A.D. Just before the Fall, a nobleman of the city gathered the priceless treasures and took refuge in Nicene, Bythenia. During the reign of the Emperor Michael Paleologos, the sacred gifts were returned to Constantinople and kept there until the fall of the city to the Ottoman Muslem Empire in 1453 A.D.
After the fall of Constantinople, the holy gifts also fell into the hands of the Turks. By God's will the gifts were received by a pious Orthodox woman named Maro, who was the mother of Sultan Mohammet B,' the Conqueror. Queen Maro was the daughter of the Orthodox Serbian King George, and who had been raised in the Orthodox Christian faith. She remained Orthodox even after she married the Turkish Sultan. When the holy gifts fell into Maro's possessions, she recognized the spiritual value them by burning incense and bestowed upon them great honors. Toward the end of her life and according to her wishes, her son, the Sultan, set aside for her a large area in Serras, by Strymona for her to live comfortably. With a royal ship, a crew, her royal treasure, and the Wise Men's sacred gifts, she sailed near the coast of Holy Mountain Athos. At that time, it occurred to her that her memorable father, King George of Serbia, George Vraggovits, was the donor and builder of Saint Paul's Monastery on Mount Athos. Next to the Monastery, he had erected a small chapel in honor of Saint George. Queen Maro decided to give the holy gifts to this Monastery in her father's memory. After notifying the monks of the Monastery, hundreds of them and a multitude of people carrying lighted candles, burning incense, and chanting hymns came to welcome the sacred gifts and their great benefactor, Queen Maro. As the parade came near a rocky shore next to a single branched olive tree (which still exists today), directly across from the chapel, a loud voice was heard from heaven saying, "Maro, do not go any farther, because in the Monastery live many monks. As a woman you are not allowed to go any closer." Astonished, the queen stopped, she opened the case, picked up the holy gifts, kissed them reverently and prayed aloud. "O holy gifts, which were brought by Persian's Wise Kings, gold, frankincense, and myrrh, to Christ God, our Savior, for the Christians' ultimate fulfillment and protection from all influence and temptations of the visible and invisible enemies; keep the faithful unharmed and preserve them in abundant health and drive away from them all the wicked spirits. Amen." With the holy father's blessings and good wishes Queen Maro boarded her ship and sailed from the coast of Mount Athos. The Gold is in the shape of square coins the size of a quarter decorated with gold wire. The frankincense and myrrh are of sweet-smelling resinous essence, which were kneaded together to form 70 spheres each the size of an olive. The priceless Wise Men's gifts are still there today in the Holy Mount Athos, in Saint Paul's Monastery. They are kept in golden cases, and according to Queen Maro's instructions the holy gifts are to remain in Saint Paul's Monastery forever.